British talent Marsh has been responsible for a variety of fan favorites on both Silk Royal and fellow Silk division Arrival recently, including his recent remix of AeroSoul's "Strings Theory" and original cuts "Smiling At You" and "Wondering Why". Yet, perhaps no track by him has had greater impact than "Sleeping Now", which was featured as the "Record of the Week" on Above & Beyond's "Trance Around The World" (now "Group Therapy") radio show. 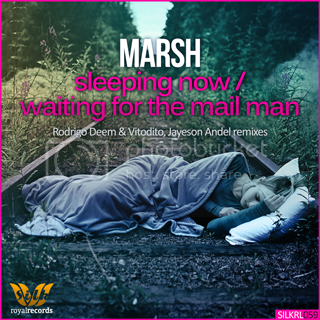 We are delighted to present a brand new remix of this sensational track by Rodrigo Deem & Vitodito, as well as an exceptional remix of Marsh's "Waiting For The Mail Man" by Jayeson Andel, a first time contributor to our imprint. Rodrigo Deem (Argentina) & Vitodito (Spain) both are coming off phenomenal years, in which they were supported heavily on many of the most celebrated trance & progressive radio shows; Above & Beyond have already kindly offered early radio support of their "Sleeping Now" remix, featured here. Hints of the original vocal hook are "teased" into the track early on, as a more "minimal" percussion pattern leads the listener to first of two breaks. After the mini-break at the quarter turn, a furious bassline begins to filter into the mix; it then erupts with massive intensity, giving the dancefloor a truly rocking groove. In the main break, gorgeous string and piano themes are added, and the ethereal beauty of the vocal sample is at its height. Jayeson Andel (Canada) is an artist-to-watch this year; he has already contributed standout originals and remixes on Nueva Digital in recent months, and his productions are not only club-oriented, but consistently intricate and innovative. Andel presents an infectious hook early on in his interpretation: a series of syncopated vocal stabs, which punctuate an exhilarating bassline groove. In the main break, we are met by a lush, "natural" soundscape. Suddenly, a flirtatious legato lead takes hold of the track, while the percussion shifts to a powerful breakbeat rhythm. The lead is joined by a variety of layered synths, all of which hit with tremendous force in the drop to follow. Last edited by Luna; Feb 5th, 2014 at 00:28.